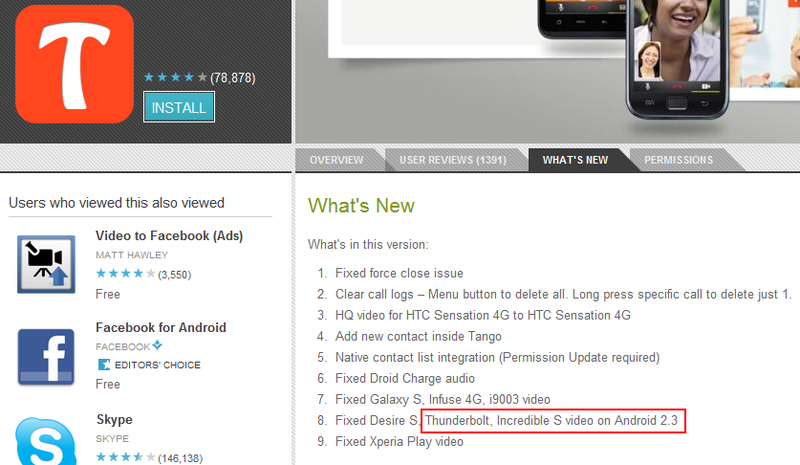 We now know that Gingerbread (Android 2.3) is up next for the Thunderbolt after receiving word from HTC support reps, but there is still no telling when it’ll arrive. We were previously told to expect it by the end of Q2 (which is Thursday), however, that seems sort of unlikely unless we see an intensive last minute push. The folks over at Tango certainly seem to think it should be here any day though. In a recent update to the app that went live over the weekend, they fixed bugs that were preventing their video chatting app on the Tbolt after flashing 2.3 to it. So is this a pretty good sign that we should be seeing it any day, now? If you look at past market boo-boos, like this one that outed Android 3.1 just days before it was released, I’d sure say so. Usually when developers get a hold of unreleased builds and start tossing out updates for them, we get a little giddy.